Drone? Emergency Medical Services? Chicago? Really?!? MedEx Ambulance Service and PropelUAS think so – and we just set out to show everyone at a world class event. While this concept is fascinating in its own right, those who work in aviation and the drone business know this use case has been discussed before. So, what makes this event so different and noteworthy? The event was the 2018 Chicago Auto Show – the largest of its kind in the US – and to say the Lockheed Martin Indago we had on display turned a few heads would be an understatement. That was the point. 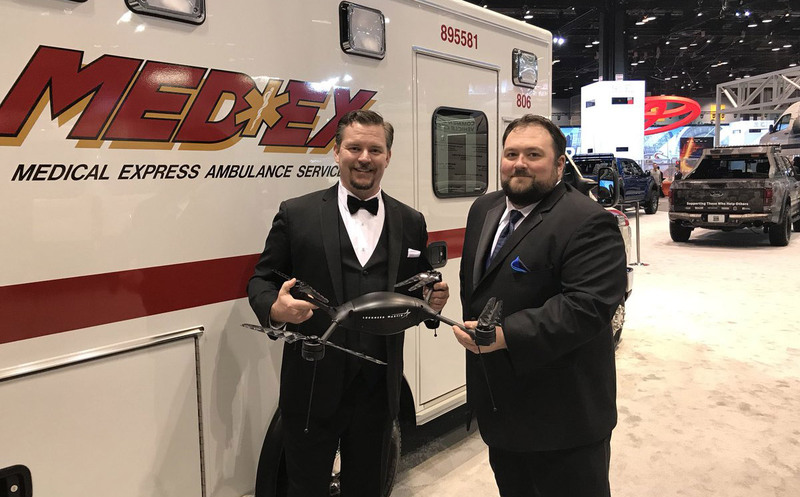 This idea of utilizing UAS technology by first responders is not a new one, but it often limited to providing ‘imaging’ support throughout an incident. This can range from infrared to incredibly powerful cameras to gain a birds-eye view and, hopefully, end the incident, whether a fire or a lost person, quickly. On the opposite end of the ‘drone’ spectrum, there is package delivery where large companies are well beyond the concepts stage of dropping a box in your yard with the latest video game, or, in the case of a grad-school paper I wrote years ago, 2 large pizzas and a 2-litre of cold pop. While most know of these current uses, the most important benefit of deploying UAS technology regardless of the situation is saving time. Time ticks away and there is nothing you can do about it. We do what we can to fight, slow, speed up, and stop time – but that clock keeps on ticking. Drones can help reduce the distance between the beginning and the end of many events and situations, so it only makes sense to deploy this capability in a world where every second counts. Imagine, sometime in the near future, where EMS is responding to an incident, but traffic is heavy. Sure, they have sirens, flashing lights, and a magic button/flasher to make all of the traffic lights green ahead of them, but it doesn’t affect the response time all that much – less than 2 minutes according to one study found on the National Institute of Health website. The individual in need doesn’t have time, they need care now, and their situation becomes more dire with each passing second. So why can’t we use the same technology being developed to deliver a large pepperoni or replacement shoes you need but the dog just chewed to deliver blood, medicine, and/or equipment to a person in immediate need? Technologically, this is all possible today – delivering packages across the sky via an unmanned aircraft has been successfully tested and proven all over the world including here in the US. Regulations, however, are the limiting factor. As an aviation expert, I can see the path being forged to enable this use case within the next few years, it is no different than many other applications. The web of regulatory red tape that exists in the medical industry and emergency response is incredibly complicated and a discussion of what’s needed had to be started to push the limits of what’s possible – introducing this concept at the Chicago Auto Show just did that.